Headquartered at Rice University, this NSF-PIRE renewal award (OISE-0968405) was a continuation of our successful PIRE I award. In total, these two PIRE grants supported our research and educational activities from 2005 – 2015. Our NSF-PIRE grant has now ended site is maintained as an archive of our research and educational activities. This PIRE project brought together researchers from Rice University, the University at Buffalo (SUNY), the University of Florida, Texas A&M University, the University of Tulsa, and many research collaborators from universities throughout Japan to investigate terahertz (THz) science and technology of nanosystems. The U.S. and Japan are world leaders in both THz research and nanotechnology, with complementary expertise that creates real value to the U.S. from collaboration. Japan is a world leader in the fabrication of nanostructures, and the U.S. is a world leader in characterization, that is, in studying the properties of materials. Our PIRE team’s research breakthroughs will lead to real-world applications, including airport and customs screening technology, next-generation wireless communication networks with ultrahigh data rates, and rapid and safe cancer detection methods. Equally importantly, this PIRE award has accomplished impressive results in fostering interest in nanotechnology, an integral part of the 21st century economy, among early stage American undergraduate students through its award-winning NanoJapan: International Research Experience for Undergraduates Program. 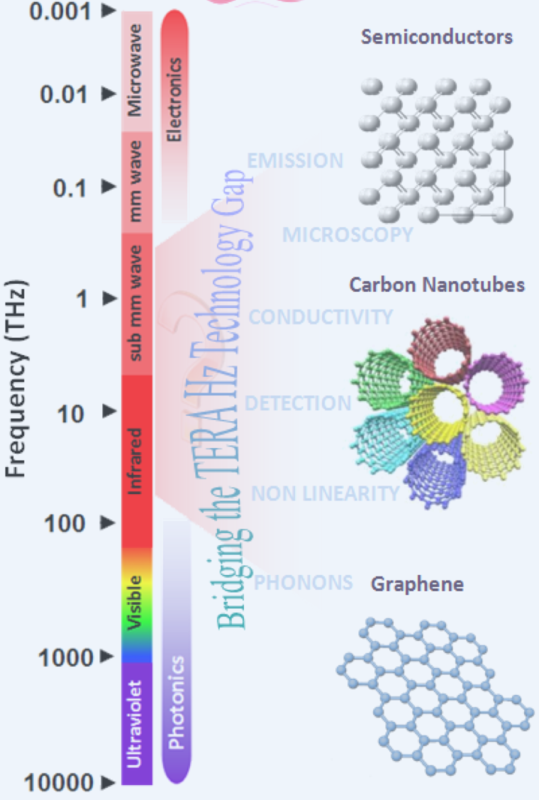 Bridging the Terahertz (THz) Gap: Bridging the Terahertz Technology Gap with Carbon Nanomaterials. Carriers, plasmons, phonons, and excitons in carbon nanomaterials move at THz frequencies and strongly interact with THz radiation – promising for THz science and technology. 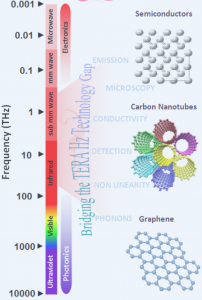 This U.S.-Japanese partnership explored terahertz (THz or 1012 Hz) dynamics in nanostructures. The electromagnetic spectrum from 0.1 to 10 THz offers many opportunities to study physical phenomena, with potential payoff in numerous technologies, such as security, communications, imaging, and spectroscopy. However, this regime is poorly developed compared to those of electronics (<0.1 THz) and photonics (>10 THz). By a judicious combination of THz technology and nanotechnology (“TeraNano”), we significantly advanced our understanding of THz physics in nanomaterials and nanostructures, while improving existing, and developing new, THz devices. PI Kono has led and managed this international team of researchers and education experts, who, together, published over 80 papers. Japan is particularly strong in materials synthesis and device fabrication, especially in the research area of nanomaterials and nanodevices, which was crucial for the success of this PIRE project. Our U.S. team members were able to fully utilize the unique samples and structures made in our Japanese partners’ laboratories in various experimental studies for increasing our understanding of THz physics and developing new device concepts for generating, manipulating, and detecting THz electromagnetic radiation. The key educational program of this PIRE grant was the NanoJapan: International Research Experience for Undergraduates Program. Recognized as a model program for the expansion of international opportunities for engineering and science students by both the National Academy of Engineering and the Institute of International Education, NanoJapan was a twelve-week summer program through which twelve freshman and sophomore physics and engineering students from U.S. universities complete research internships in Japanese laboratories in nanoscience, photonics, and condensed matter physics. By involving students with cutting-edge nanotechnology research projects, NanoJapan tightly integrated the international experience with students’ academic program. NanoJapan aimed to increase the number of U.S. students who pursue graduate study in nanoscience and cultivate a generation of globally aware students who are prepared for international research collaboration. 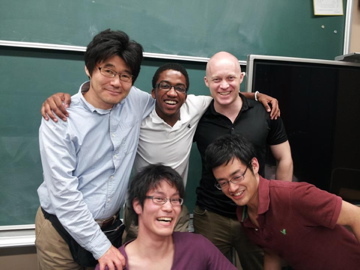 Forging Friendships Across Cultures: NanoJapan 2013 participant Ron Keith Hobson II (center) from Morehouse College with Prof. Shigeo Maruyama of the University of Tokyo (back row, left) and his lab mates including Dr. Erik Einnarson (back row, right). Dr. Einnarson served as a research mentor for many NanoJapan students in the Maruyama Lab until he moved to a faculty position at the University at Buffalo (SUNY) in 2014. While in Japan, Ron conducted research on the “Diameter Dependence of Vertically-Aligned Single Walled Carbon Nanotubes in Dye-Sensitized Solar Cells”. Ron also participated in the Optics in the City of Light REU in France in the summer of 2014 and, as part of the Morehouse’s Dual Degree Engineering Program, transferred to the University of Michigan and is expected to receive his B.S. in Materials Science and Engineering in May 2017. From 2006 to 2015, 144 students participated in the program, representing 49 different U.S. institutions, including two historically black colleges and universities, five community colleges, liberal arts colleges, and a wide range of public and private research institutions. The program was particularly successful in recruiting underrepresented STEM students, notably women. Female students represented 35.4% of NanoJapan participants overall, and 16.8% represented diverse ethnic groups in STEM fields. The representation of women is particularly impressive given that NSF data shows that, in 2010, the year our program began, female undergraduate students earned just 16.98% of engineering and 20.41% of conferred physics bachelor’s degrees. As a further testament to the impact on students’ career development as science and engineering researchers, to date, twelve NanoJapan students have been listed as co-authors in peer-reviewed journal articles published in prestigious journals. A very high percentage of NanoJapan students complete their STEM degrees, and more than 90% have gone on to advanced STEM degree programs or jobs in the STEM workforce, far higher than the national average. Japan and the U.S. are the global leaders in THz research and nanotechnology. To further advance THz science and transition new ideas from the lab into commercial products, it is important to stimulate cooperation between these countries. Japan realizes the urgent need to internationalize its scientific enterprise and has committed to significant investments to attract leading scientists from around the world. However, there remain obstacles to such international collaboration, primarily language and cultural barriers that divide our students and researchers. By breaking down these barriers, the already high level of funding in both countries can have an even greater scientific and societal impact, since future generations of researchers will have a better understanding of both the culture and the state-of-the-art technology in each country. Our experience with the development and implementation of the TeraNano PIRE project and the related NanoJapan: IREU Program has shown that both graduate and undergraduate students see this program as combining the best aspects of intensive, cutting education research in an emerging field with integrated international experiences that build upon the best of a traditional study abroad program. This suggests that IREUs can be an important model for engaging STEM students in meaningful programs abroad and preparing them with the technical and research skills necessary to become future leaders in America’s science and engineering workforce. Other Related International Research Programs for Students: In 2016, our team was selected by the Nakatani Foudnation to implement the Nakatani RIES: Research & International Experience for Students Fellowship. We encourage U.S. and Japanese undergraduate students to visit this website for more information on this exciting international research experience program.